In a Nutshell: As the economy grew in the decades following World War II, so did the income levels for a vast majority of workers. But in the 1970s, policymakers began to favor the interests of employers over employees — resulting in wage stagnation and rising income inequality. Researchers at the Economic Policy Institute argue this isn’t just bad for individuals but also for the economy. The EPI believes that only by enacting policies that favor workers can the U.S. ensure the American Dream remains viable for generations to come. The United States emerged from World War II as the leading superpower, and, as the country celebrated the end of a long era of depression and conflict, Americans looked forward to prosperity at home. The economic promise of the American Dream held true for much of the post-war period. Wages rose in line with productivity, and even those on the lower rungs of the economic ladder could achieve a better life for themselves and their children through hard work. But starting in the 1970s, the relationship between productivity and wages broke down. While the economy continued to grow, the fruits of that growth were distributed less broadly as more of the gains were captured by those at the top. What went wrong? Was that decoupling of wage and productivity growth a natural consequence of economic modernization, or can it be changed? The Economic Policy Institute (EPI) argues the latter — that the demise of wage growth since the 1970s results from deliberate policy choices favoring capital over labor. And EPI says these choices haven’t just harmed workers. When people can’t earn enough money to fully participate in the economy, overall demand suffers — which dampens growth for everyone. Heidi Shierholz, EPI Senior Economist and Director of Policy, spoke with us about the organization’s mission. Income inequality has risen dramatically in the past several decades, and wage growth has stagnated. Had wages continued to rise along with productivity as they had in the decades following World War II, an American earning $50,000 per year today would instead make nearly $75,000. Tilting the economy back toward low- and middle-wage earners won’t be easy. That’s because the legislation favoring corporations over workers has seen policymakers use many tactics in pursuit of their goals. Those failures have made coping with the upheavals of globalization even more challenging for lower- and middle-wage workers. As the economy has expanded globally, it has exposed more workers to competition from even lower-wage workers around the globe. But corporate profits remain insulated from that competition. Meanwhile, the U.S. labor market has been systemically weakened through a slew of policy choices aimed at eroding the leverage and bargaining power of workers. In labor standards, for example, resistance to an increase in the federal minimum wage has resulted in its decline of more than 25%, comparatively, in the last 50 years. These policy decisions have also decreased the thresholds for overtime pay and taken paid sick time away from workers. Shierholz said the irony in this situation is that economists are complicit. For example, they’ve argued for decades that raising the minimum wage would hamper growth and cause job loss. “It’s almost like we’ve conducted a natural experiment to see if we decimate wages, maybe we’ll unleash growth,” she said. But the models used to justify that argument were imprecise, Shierholz said. States that have recently increased the minimum wage have seen increases in efficiency as wages come closer to workers’ output. The same is true with unionization. A common assumption has been that the decline in union participation that has occurred since the 1970s has happened naturally and that it’s a net positive for the economy. EPI argues that’s false. Rather, deliberate and aggressive employer union-fighting tactics have led us to the situation we’re in regarding unions. 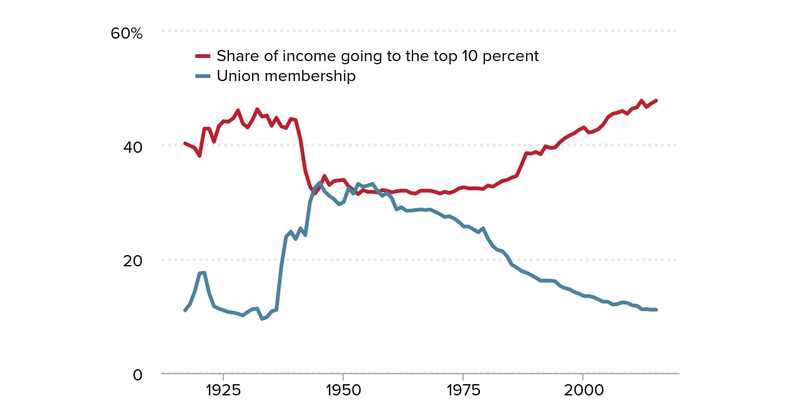 As union membership has dramatically decreased, the economic prosperity of the top 10% has increased. That being said, Shierholz sees promise on the horizon, noting that recent teacher strikes in red states like West Virginia and Oklahoma and the fight for a livable minimum wage both enjoy widespread union and worker support. “Although we have a long way to go, we see workers growing more comfortable exercising their rights and joining with other workers to get their fair share of the economic pie,” Shierholz said. The U.S. economy prospered after World War II thanks to a booming middle class and wage growth based on productivity. That’s why many of EPI’s policy prescriptions hinge on “middle-out economics,” which focus on the buying power of the middle class as a major ingredient for job creation and growth. With consumer spending typically responsible for two-thirds of the economy, policies that can increase consumer spending — like support for minimum wage increases and unionization — are key. The problem is that the rich don’t spend enough. As income inequality increases, more money goes to people who already have plenty. So that money rarely makes its way back into the economy the way it would if it went to lower- and middle-wage workers. 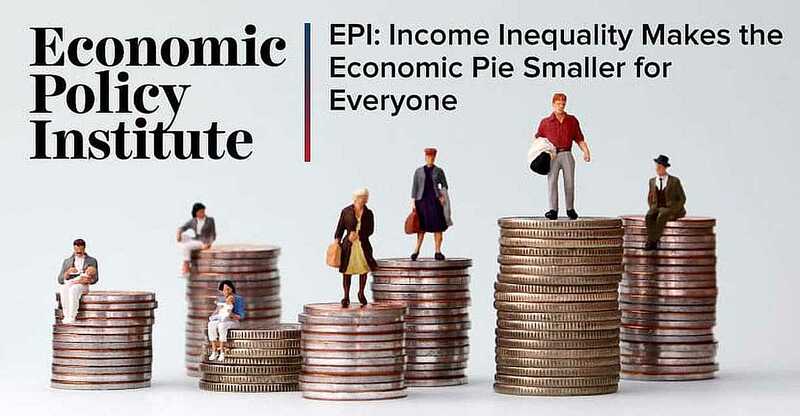 With that in mind, EPI continues to amass data and analysis in favor of policies and programs favoring the working class, as it has since 1986. Establishing that the success of lower- and middle-wage workers is a fundamental metric for gauging the economy. And EPI’s goal is to help shape the policies of the future aimed at helping everyone achieve long-term prosperity.